Editors note: Since publishing this story, a firestorm of controversy and debate has erupted in the comments below. To address these and other issues, the author of this post, Elias, has written an addendum which you can find below. Click here to jump straight to it. The following is a first hand account of what went on behind the drab gray exterior of the USA Pavilion at the 2010 Shanghai expo — a tale of greed, indifference, corruption, rebellion and eventually justice — written by one of the Student Ambassadors who worked there. The USA Pavilion was ruled by its coporate sponsors — sponsors who callously used eager Chinese volunteers, deceived and eventually politicized student interns and twisted an image of the US to fit their branding desires. How did the pavilion morph from a nation’s showcase into a corporate advertising campaign? It began in 1990, when the US Congress passed a law (U.S. Code Title 22 2452b) restricting the US State Department from providing public funds for World’s Fair Exhibition in an effort to curb the suspicious allocation of capital that had marred World’s Fairs of years past. Henceforth, funding for US participation in World’s Fairs has been limited to private sources only, which would assumedly be easier to track and control than mysterious government funding. The US pavilion’s Commissioner General José Villarreal, a lawyer from San Antonio with ties to the Clinton family, spearheaded much of the fundraising efforts for this year’s pavilion. Over the course of what Villarreal describes as “particularly trying months,” he was able to reel in support from a cast of corporations and state governments, including Wal-Mart, Johnson and Johnson, and the State Department of Texas, among other sponsors. Much information is available from mainstream news sources regarding the fundraising and diplomatic dilemmas surrounding the construction of the USAP. Among those, I recommend interested readers to take a look at Adam Minter’s independent blog Shanghai Scrap (May 3, 2010), which probes the questionable allocation of funds. As much as I wanted to refrain from picking apart the numbers, there is one figure I cannot let go without mention: the $575,000 price tag on the Commissioner General’s Office. Forsaking any hopes of anonymity, I used to work right next to his office and lounge, both of which are Spartan even by Chinese standards. I’ve stayed at $40 hotels in China (238 RMB) with nicer interior décor. Even if you bought new computers and office supplies, the cost of constructing the rooms would be less than $5,000. So why does this assessment describe the Commissioner’s office at a price of over half a million dollars? The student guide program, which employed 140 people over a 6 month period, costs a mere $932,000. When students and volunteers took a look at numbers like these and compared them with what they were actually experiencing in the pavilion, even the most patriotic among knew something was very, very wrong. In April, a group of 75 student ambassadors (SAs) arrived in Shanghai to begin training for a three-and-a-half month internship at the USA pavilion. Borrowing a page out of USAP sponsor Wal-Mart’s labor record, salaries for SAs and junior staff were set at very low levels. Prior to arriving in Shanghai, SAs were told that they would receive a stipend of around $18 a day, which was supposed to be sufficient based on the cost of living in the area. Many junior staff made a salary of around 6,000 RMB a month (less than $1,000), and had to pay for their own housing. In terms of work hours, SAs were expected to work around 40 hours a week, whereas staff members did not have actual limitations and often worked upwards of 50 or 60 hours a week without overtime pay. During the first week of July, dubbed “National Week” in celebration of American Independence Day, members of the Entertainment staff and their SAs put in 10 to 12 hour days, and were pressured to try to out-work one another. All staff were supposed to have 2 days off within a 7 day cycle, yet during busy times staff were expected to come in for half days on their days off and answer work-related phone calls at all hours of the day. Thus, an environment of mutual exploitation came about, staff would “one-up” each other by working extended hours on their days off, joking about blatant breaches of labor codes rather than confronting their superiors. Price-gouging within the World Expo site and in Shanghai more generally rendered both junior staff salaries and SA stipends insufficient. Lunch or dinner in the World Expo site would run between from 30 to 70 RMB ($4.5 to $10), and taxis from Pudong to Puxi (Shanghai city proper) ran from 35 to 70 RMB each way. One would be hard-pressed to live on $18 a day unless one never ventured out of the Expo and took health risks by eating the cheapest food available. The cheapest food options were found at a convenience store chain named Family Mart, where one could purchase a microwaved set meal for 18RMB. Such meals were packaged in several layers of plastic, which are known to emit dioxins and other toxic substances when microwaved. These Tasty Toxic Treats were limited to fried chicken and greasy pork, so those who abstained from eating meat or wanted healthier food had to fork over larger amounts of cash at foreign chains such as Starbucks. Starbucks in China sells salads, vegetarian or chicken sandwiches and soups. Senior staff distributed KFC vouchers to SAs in what they said was an attempt to defray the costs of eating at the Expo. The SAs were well aware that Yum Brands was a sponsor, so while some saw it as a low-cost means of providing food, others viewed it as an attempt to enforce brand loyalty. The SAs were split into several areas of employment: Operations, Protocol, Communications, Finance, V.I.P. Suite and Entertainment. Those who worked in Protocol or V.I.P. had the opportunity to witness celebrity and government visitors (i.e. a picture with Al Gore), while the Operations team were not only left in the dark as to the schedule of such appearances, but also locked into rotating work shifts out in the hot summer sun dealing with millions of visitors. Needless to say, “office vs. operations” tensions developed, and this led staff members to reconfigure the Operations’ schedule by offering longer breaks, shorter hours and team dinners to compensate for the other disparities. Nowhere were these disparities clearer than in the V.I.P. Suite, an exclusive upstairs lounge named “1776 suite,” devoted solely to entertaining and hosting functions of top-level sponsors. A membership card system was enacted for employees and friends of USAP sponsors. Initial scheduling preference was given to “global sponsors,” companies that donated over $5 million. The USAP expected high volume attendance in the 1776 suite, so it had a rotating schedule of 15 well-qualified SAs. But attendance at the suite was incredibly low, and much of the SAs’ 8.5-hour shifts were spent waiting by the door for visitors like concierges, or competing with secretaries for access to the reception computers. During the overlap between morning and afternoon shifts, it was common to have five or six SAs standing around in the upstairs and downstairs lobbies with absolutely nothing to do, merely waiting out the final hours of their shifts. So while VIP SAs joked away the hours and played online games, the rest of the staff were outside dealing with the myriad problems that arise with crowds of over 30,000 visitors a day. The inequality was even greater when it came to how the Chinese college students were treated. Chinese college students with strong English proficiency were told they would have summer internships at the USAP, which they believed would be a prestigious position. What they were not told was that their “internship” would consist of doing janitorial work for Diploma, an outsourced janitorial company. Instead of working hand-in hand with Americans, they swept stairs, cleaned bathrooms and emptied rubbish bins. These interns/janitors were paid poverty wages, some as low as 900RMB a month. Frightened about being fired, few spoke up about their working conditions, and those who did only did so with those they trusted. Many cross-national friendships were founded in the lavatory, where one would encounter a Chinese college student the same age cleaning toilets. Many SAs felt uncomfortable learning that that their Chinese counterparts had a monthly salary half of what an American SA would make in a week. Correct me if I’m wrong, but isn’t the proclaimed goal of the World Expo to strengthen global ties and promote international unity? Does this disparity of income not mirror the same WTO policies that exacerbate such social stratification in the first place? The hypocrisy finally got to the SAs, so one evening in late June, a group of six to eight women and men gathered together in an apartment to discuss how to put their grievances into action. As interns and staff they were fed up with being lied to and swindled by USAP management, and refused to be pawns to its corporate sponsors. They decided to draft a formal letter addressing their grievances and distribute it to all the SAs for approval. When the group of brave individuals brought the drafted petition to the workplace and shared it with other SAs, it was met with extraordinary enthusiasm. Several other workers wanted to get involved in the movement and met for a subsequent meeting to draft a new letter to the USAP management. What was most inspiring about their actions is that, for the most part, these SAs were the type of people who were not involved in labor agitation or social activism in the past. Some of them would probably have been the same folks who would have teased my peers in hunger strikes, speak-outs, and critical mass marches during my college years. No, rather this time it hit home: SAs and junior staff united on common ground to make their voice heard. “This letter is directed at the management of the U.S.A.P. and was written through a collective effort by the Student Ambassadors. As Student Ambassadors, we feel that there is a serious set of problems affecting our well-being, morale, and safety. These problems stem largely from misinformation, inadequate compensation, and a general inattention by U.S.A.P. management to meet some of our most basic needs. These problems are outlined below. We sincerely hope that you will hear our concerns. First, from the beginning of the program, we have received almost no information about the nature of our jobs. Not only was the application vague, but also neither the pre-departure pack nor the weeklong training program gave us any description of our duties. There should have been a detailed explanation of what we would be doing as student ambassadors. It is unacceptable that an employer keeps its prospective employees in the dark about their responsibilities. Second, there is the issue of pay. Many pavilions pay their staff western wages. On the other hand, we receive pay less than many of our subcontractors (IVG, Dance America). We firmly believe that we, as well as the second session ambassadors should receive fair pay and treatment. Furthermore, we are appalled at the wages and mistreatment of our Diploma staff. As an entity representing the United States we would hope that the U.S.A.P. would uphold the labor and wage standards enjoyed by citizens in our own country and not seek to exploit our host country’s “cheap” labor force. ourselves about the staff cafeteria and it took more than a month to get credits put on our IDs. Information about benefits and services offered to expo employees should have been given to us from day one, not during the last month of our stay. We feel that we should be compensated for lost wages prior to being given a reasonable food stipend. Finally, there is the issue of neglect for the general health and well-being of some of the Ambassadors. There has been a mold problem in many of the apartments where we live. This has created a serious health risk to the Student Ambassadors and other USAP employees living in the Expo Village. Although numerous complaints were made, nothing has been done to remedy the problem. In addition, we were all promised health insurance coverage for the duration of our service here. However, several of us have had serious illness (some thought to be caused by the mold in our apartments) and when we sought medical treatment had to pay thousands of RMB out of pocket since our insurance does not cover even the most basic medical care. This is an expense most of us simply cannot afford. The actual presentation of the signed petition was not overly dramatic, as the management had already been informed that the SAs were collecting signatures and support at the workplace. In response to the petition, the management advised the creation of a Student Ambassador Forum and subsequent Working Group, spearheaded by two female and four male SAs. Each student ambassador that took part in the forum was responsible for a specific area of concern, these included; Living conditions, Office culture, Food stipend, Job assignment, Sub-contractors and Health Insurance. The first meeting of the Student Ambassador Forum was on July 11 at this time the concerns were voiced from by the respected SAs. An overview of the meeting was sent out by email to the SA listserv. This eventually became a thread of over 35+ responses from SAs, a democratic means of sharing information and opinions on the struggle. On July 12, the six SAs representatives to the Working group met with USAP’s Human Resources director in an effort to reach consensus upon solutions to the proposed issues raised by the SAs Petition and working group. After much deliberation and fiery rhetoric within SAs and between senior management, a compensation agreement was agreed upon. Taking account for the fact that new SAs would start at 1,200RMB per week whereas we had to fight for a raise from 850RMB brought grounds for retroactive compensation. Food stipends and medical costs were also calculated in the final 2,550RMB deal. Could this lead to Justice? Ultimately, this petition paved the way to reclaiming justice at the United States Pavilion. SAs and junior staff members learned an important lesson in organizing and tasted the flavor of corporate America. Some of the young women and men that took part in this initiative may never partake in political or labor agitation in the future, but I am certain that, for some, sparks of personal activism have been ignited, fanning the flames of the international movement for social justice. Given the praise and notoriety this piece has brought I would like to provide a formal addendum. First off, I am very grateful that so many SAs provided honest comments to this piece. The issue of certain individuals over-posting or waging personal battles is a byproduct of an open forum for comments. Charlie, the editor of Chengdu Living, decided against censoring comments, although at times I wish he would have trimmed some portions as discussions drifted far away from SAs, the element of this piece. All who worked at USAP had a different experience and mixed feelings about living in Shanghai. Clearly there are conflicts of interest based on personal and political opinions: I do not have ill feelings towards any former SAs, although, given the nature of the comments perhaps other may not feel the same about me. I was fortunate to work alongside a team of very bright and well-rounded American college students and recent graduates. After all, this was a competitive position and I’m very proud of my colleagues who are now in law school, medical school or pursuing entrepreneurial work in Asia. Echoing the fashion that the US fights its wars, USAP was outsourced to corporations. Just as the US military outsources laundry or logistics to Kellogg Brown and Root subsidiaries, USAP was outsourced to any corporation willing to pay $5 million to become a “global sponsor” and put its logo on the pavilion. Thus it is expected that a corporate environment would prevail: Walmart sponsored the “rooftop garden”, Yum Brands sold KFC and Pizza Hut, Chevron taught visitors about its stellar environmental record, and so on. Moving back to the issues of the SAs, the original title of this piece was “Shanghai World Expo 2010: USA Student Interns Defy Corporate Control” the original version can be viewed here for those with interest. 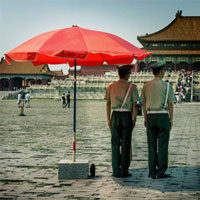 The editors at ChengduLiving shortened the piece and amended the title to make the piece more blog friendly. I believe that the title “Greed and Corruption” set an overbearing negative tone. The point of this piece was to showcase that well-qualified, well-educated young Americans were upset by the means that their country was represented and the unprofessional way in which they were initially treated. Had the first session SAs, not confronted authority and made their voices heard, then perhaps the 2nd session SAs would not have had the rosy experience that Antoine described. My personal experience was not entirely “doom and gloom”, I had the chance to introduce and interview Herbie Hancock and DeeDee Bridgewater. I grew up playing bass in jazz band and listening to DeeDee’s program on NPR, clearly this is an experience I’ll remember for the rest of my life. Additionally, I enjoyed working with Abigail Washburn’s band, I first met her in Chengdu during the release of the album “Afterquake” which featured songs sung by children living in the aftermath of the 2008 Sichuan earthquake. I spent countless hours running sound and working the stage for daily Dance America performances. The Dance America crew was a lively bunch of characters and really helped USAP “save face” especially in the long lines and heat of June and July. In conclusion, this piece was an alternative take, a behind the scenes view, based on ethnographic information. The mainstream press did not cover this story, nor it is likely that they will pay attention to it now. I should note that I have been contacted by a journalist from NPR, who may be interested in working on a short piece. As a writer, and supporter of independent media, I believe that people need to take it upon themselves to share their stories and experiences that would otherwise “slip under the radar”. I did not want this to be the case for the story of SAs that organized against the corporate nature of USAP and fought for progressive change. Surely there are still questions of how the $61 million was spent, and, given the voluminous comments on this piece, corruption, is on the tips of peoples’ tongues. However, I do not possess financial documents to make any formal statements on such matters, the management at USAP wasn’t exactly eager to share such information. But I do hope that the former staff enjoy their 2-month pay bonuses, the junior staff truly deserve them, clearly there was a lot of money left over after all. I agree, fantastic piece, thanks for publishing it. I wonder if similar practices were common at other Western pavilions — particularly regarding the exploitation of Chinese college students. I talked to some Chinese students at the Turkish pavilion. They were serving coffee, but there was a Turkish guy with them, a student at Fudan himself. Everybody seemed pretty happy. What was the final deal? Everybody got 2250RMB? Anything else? The USA pavilion has leftover money. Where o where will it go? And I wonder, just how is that IRS investigation going? Shouldn’t the money go back to the sponsors, like Walmart. You should look for it in Walmart’s income statement. Actually, I am glad that the US has a law forbidding the US government to pay for this. I don’t think US need to have pavilions in EXPO to get more people to know US exists. If a US corporation needs to use it to market it’s own image, they can always sponsor one, and organize it to get the best value for the money spent. And if Walmart think paying walmart wages for walmart sponsor events, that’s fine with me. First off, there is no law barring US participation in Expos. That was a Bush Administration Big Lie spread via a naive press to cover for the policy determined in 2006 of privatizing the pavilion. There was no need to garner private funding. To do so was a conscious decision made by both the Bush and Obama Administrations. Second, the IRS investigation may be proceeding. I filed my complaint against Shanghai Expo 2010, Inc., the private owner and operator of the “USA” pavilion, on May 20, 2010. It was acknowledged as received by the IRS in August 2010. US law prohibits the IRS from releasing information about ongoing investigations or their dispositions. However, it’s possible we may hear something shortly, via a different (and legal) channel. The question of what happens to the assets, how’re they’re distributed, is a big one. Allegations have been raised that at least some of the estimated large surplus of tax-exempt corporate investments in Shanghai Expo 2010, Inc., went to the US Chamber of Commerce via its Shanghai AmCham affiliate, to be used for campaign ads in the recent election. But obviously, a lot of money is still slushing around. ‘Scuse me, I was unclear. My first sentence should be, there is no federal law preventing the State Department from funding US participation in Expos. The code Elias cites merely requires State to seek an appropriation from Congress to fund a pavilion. Since almost every other federal expenditure of this nature requires an appropriation, this is not much of an imposition. The rest of the paragraph stands as is. I must admit, given the glitzy descriptions of SA life provided on various blogs, by Shanghai Expo 2010, Inc., the owner and operator of the pavilion, and the State Department. I have no doubt that what Elias reports is accurate, which means that (a) a lot of SAs got used to working long hours at pauper’s wages and/or (b) the other accounts are sugar-coated. It sounds to me that the SAs were treated like TAs — college teacher-assistants — before TAs finally got organized. Elias is right: organize or get pulverized, those are your choices in the corporate scheme. Even computer nerds have learned that. @ Bill, Remember Expos are a continuation of World Fairs, a venue to educate about national culture and promote trade. 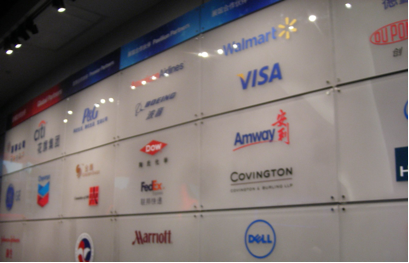 At the Shanghai EXPO there was an opportunity for corporations to have their own pavilions in the Puxi Side of the Expo. Wal-mart could have followed suit with the likes of Coca-Cola and had their own pavilion. 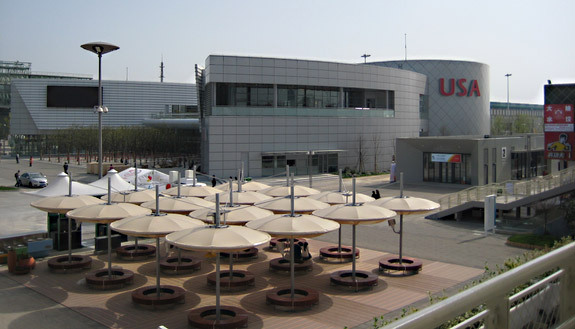 The USAP was essentially prime “real estate” for advertising as it was on the Pudong side of Expo grounds, where the largest number of visitors came to see NATIONAL pavilions. Sascha made the photo comments, If it were up to me, I wouldn’t have had a caption referring to USAP as as re-branded Wal-Mart. Chevron actually had a much larger presence within the pavilion. Moving aside from discussions about the sponsors, the focal point is that if the US should not participate in EXPO if it neglects to use it as opportunity to improve international relations or educate visitors about US culture. Living abroad for nearly 2 years, I can affirm that popular opinion on the USA is on the decline, it is a shame that such a pitiful presence at the EXPO only reinforced poor stereotypes rather that showcasing what the USA has to offer. Y’all are talking about this like there’s nobody responsible, just this thing called the USA pavilion. I say you take a look at the Shanghai Consulate which was deeply involved in this thing from teh beginning. A few people over there might know a thing or two. Nice job, State Department. Good story. But justice? To the workers perhaps, but I still don’t know where the more than half a million dollars for the big shot’s office went… I hope this story will have followups (any way, anywhere, anyhow) to get this cleared as well. Minor revision, after talking with a former staff member, she mentioned that the Diploma janitorial salaries for Chinese students were closer to 900 RMB a month. This is still poverty wages for a city like Shanghai in which nighttime taxis flag at 16 RMB and simple gaijiaofan meals range from 9-12RMB. I will follow through with a friend who worked for Diploma to get more information about their working conditions. These students were not willing to share much in fear of losing their jobs, but now that the EXPO is officially over it may be worth looking into. @ Expo Ghost yes the Shanghai Consulate had a large role, Beatrice Camp, consulate director took part in the initial “ground-breaking”(shovel in hand photo-op) ceremony but it is uncertain as to how much oversight she possessed. I’m skeptical that the folks at the Consulate had much to do with the actual layout and construction, as it was all out-sourced to private companies. But it wouldn’t surprise me if someone along the way received a large sum of money to look the other way an allow corporate sponsors to brand the entire pavilion rendering it as an advertisement rather than an exhibit of American culture. @ Martin, colleagues that are now just leaving USAP have mentioned puzzling numbers in the accounting department time and time again. There is undoubtedly a large surplus of funds leftover that will end up in a few bank accounts, funds that were supposed to be used to provide a positive experience for world guests. My own posts are indexed here: http://huffingtonpost.com/bob-jacobson/. They deal with the finances of the pavilion in the context of how the scheme was set up and run, and the meta-context of the privatization of American diplomacy. Fantastic- thanks for linking to those and commenting, Bob. I’ll definitely be checking your articles out. One further clarification: the “Office of the US Commissioner General” in the document obtained from Shanghai Scrap does not mean only the literal office of the US Commissioner General. The USCG has other duties to perform, like fundraising, taking out the corporate CEOs who invested in Shanghai Expo 2010, Inc., shaking Chinese officials’ hands, and reporting back to Secretary Clinton. In this case, Villarreal also did a fair amount of pitching Shanghai Expo 2010, Inc., to the media. The problem is, Shanghai Expo 2010, Inc., the owner and operator of the “USA” pavilion, is a wholly private, tax-exempt corporation. This has never been the case in the past because US pavilions were always US Government owned, thus the USCG served the US Government, not a private company. But if through some fluke of the law it is a tax-exempt corporation, it shouldn’t be employing Villarreal, an appointed US Government official (with ambassadorial rank) in any capacity. His job is highly political and involves lobbying as well as conducting oversight of the pavilion effort — impossibly contradictory responsibilities. As a tax-exempt corporation, Shanghai Expo 2010, Inc., by paying Villarreal’s salary, may have violated IRS regulations regarding using funds for political purposes. Additionally, Shanghai Expo 2010, Inc., by using Chinese money the Consulate allegedly obtained to operate while the company was in distress — before Hillary Clinton stepped in and raised investments in this private company — Shanghai Expo 2010, Inc., may have violated the Foreign Agents Act. The student ambassadors’ and staff’s plight was a tragic byproduct of mismanagement, but by no means the larger dimension of this problem. Whenever bad guys succeed in pulling off a perfect crime — if the IRS or the Justice Department don’t intercede for political reasons — it sets a bad precedent. I hope that’s not the case here. I spoke with Jose Villarreal and he insists that he has taken no money from Shanghai Expo 2010, Inc., or any element of the pavilion operation. He pointed out that the document cited by Elias was a planning document. It was presented to the IRS in June 2009, when SE 2010 applied for expedited tax-exempt status. Jose says that in his case, at least, the document as presented was not implemented (which raises questions about the veracity of the rest of SE 2010’s presentation to the IRS, accepted without question — but that’s another story). Jose says that his time on the job as Commissioner General was essentially pro bono. I’m inclined to believe him, but without open books and tax filings, it’s impossible to verify his claims. I made this point with him, strongly: that in his final report to the President and the Congress, he must emphasize the damage done to the American effort in Shanghai by its lack of transparency, accountability, and inclusiveness. SE 2010’s and the Consulate’s fondness for backroom deals, petty political power plays, and an obvious neglect of, not to say contempt for the American people, negated any positives the pavilion might have generated among the Chinese and the other Expo participants. Our current standing among those in the know about the Expo, I am told, is extremely low. Chinese officialdom must laugh its head off each time someone over here orders them to fix their currency. We can’t even account for $100 million and we want them to redo their loans to us? Ha ha. This needs to be fixed before we blunder through Yeosu 2012 and even more, Milano 2015. Or does the US need the whole world to think America’s a bunch of yahoos dominated by a corporate class who’ll do anything for money? These impressions last for decades. The Europeans are still smarting over our standing them up at their coming-out ball, Hanover 2000. A page in the catalog read, “The United States has declined to participate.” Well, how much better is it to participate but do it with zero class? Parenthetically, Jose told me he was surprised that SE 2010 has filed no tax returns (that’s what the IRS told me, you can double check on http://www.Guidestar.org). I hiccuped when I heard this: if the Commissioner General is in the dark concerning the fiscal reporting of SE 2010, how can he objectively analyze the company’s operations in Shanghai or its financial management? How can he make serious recommendations to the President and Congress — based on what? Personal experiences? Vibes? What the corporate chieftains told him? I like Jose and even though, for my taste, he got a little too close to the pavilion organization and too enamored of its hype, he’s not the main issue here. Like many others, he was a well-meaning pawn caught up in the negative energy fields generated by forces greater than themselves: pernicious policies put in place implemented by truly evil individuals. Many of us (I’m surprised how many) know who they are and what they’ve done. Now’s the time to turn over the rocks and let the sun shine in, a little hygiene before the next Expo. And give us back our tax money. @Bob just sent you an email. Regarding Villarreal’s role there is room for a whole story in and of itself. In an early draft I suggested that the figure from shanghai scrap probably represented a portion of Villarreal’s salary however one of my first proof-readers suggested I not mention it without concrete evidence. On another note, nepotism was a main component of employment at the USAP. But to be fair, I have first hand evidence of it occurring at other pavilions as well. And Bob you are not alone in questioning the means in which Shanghai Expo Inc. is a tax-exempt corporation, several other SAs and staff brought this up during the opening months of EXPO. @Singapore, Did you volunteer at the youth olympic games? I’m not familiar with the event nor the politics. However I can make a comparison with the volunteers at EXPO. The young Chinese donning green-jumpsuits were harassed by visitors to such an extent( *especially at bus stops*) that they had mandatory counseling from psychiatric professionals. The EXPO volunteers, as the name implies were not paid, but did receive a food stipend on their ID cards which could be used at staff dining halls. When USAP finally enrolled in the food stipend program, many SAs and staff from other pavilions bonded in the canteens. The trading of EXPO pins (national flags, haibaos, corporate pavs. etc) served as the basis for conversation and friendship for some and a total annoyance to others. State Department people were all over the pavilion. Tom Cooney was the deputy CG for goodness sake, so if he missed the mis-treatment of staff and SAs, it’s no credit to him or his bosses. Then again like most state department drones he’s more concerned with career and the bureaucracy than his country. I’m sure he’ll be promoted on the basis of this failure. Cooney played a special role the year earlier. When Shanghai Expo 2010, Inc., went into distress in late 2008, having raised no money since its initial infusion of Chinese money in May 2008, a collection of American expats (many members of Shanghai AmCham) and the team in waiting of which I was a part (we’d “won” the 2007 RFP to create a pavilion, but didn’t get the job) approached the Consulate and asked Bea Camp to arrange some sort of coalition, to bring our combined resources to bear. We had a $30 million pavilion scheme, potential corporate sponsors, and a networked display scheme in keeping with the 21st Century. Camp refused. When one of our group’s members, an independent American pavilion producer who’d just won the Best Commercial Pavilion Award at the Olympics for Coca-Cola, went on Bloomberg to argue for the combined team, it was Cooney — a big, strapping ex-rugby player — and a thuggish assistants who afterwards grilled the much smaller producer during a very unpleasant debriefing. When AmCham hosted meetings about the crisis, the Consulate and AmCham conspired to keep out anyone not in their inner circle. Why they were so determined is anyone’s guess, because the triumvirate foundered for the next six months until Hillary stepped in and shook the corporate money tree for a reported $60 million-plus in corporate investments for Shanghai Expo 2010, Inc. supplied by 60-plus Chinese and American multinationals. That number may have gone as high as $100 million by now, with a lot of it still slushing around as the Expo closed and elections in the US heated up. I would never suggest that the money was somehow laundered through AmCham and passed to the US Chamber of Commerce for its dirty work in running secret hit campaigns against Democrats. There’s no evidence for it because there’s no evidence for anything. No tax returns, no books, no nothing. As someone asked above, what is going to happen to the surplus? What, there’s a surplus? Prove it! The Consulate was not acting in behalf of the American people in Shanghai. The orders it was carrying out, transmitted from Foggy Bottom, were for another purpose. “Chinese visitors voted the USA Pavilion as the most disappointing foreign pavilion at the World Expo 2010, according to a survey released yesterday by Shanghai Jiao Tong University. “The survey was a sharp contrast to one by Millward Brown-ACSR and Ogilvy in January, which found the USA Pavilion was chosen as the venue Chinese people most wanted to see. “In the recent survey, many respondents said the pavilion had a poor design as it looked like a shopping mall. They added its exhibits were vague and empty, said Liu Kang, dean of the university’s Institute of Arts and Humanities and leader of the survey. It’s really a shame that this pavilion has reinforced a lot of the negative connotations that the international audience has about the United States – indifference, an end justifying the means, self-serving corporatism, etc. 你好，I am another SA from the USAP, a member of the working group that negotiated with management, and an office worker in the finance department. As a student ambassador, I felt honored to receive any compensation, given that business internships do not always pay, but as the author wrote, I had to eat the cheapest and most dangerous of foods in order to make the stipend last. As a member of the working group, I requested help or compensation for those student ambassadors who were too sick to work because of the mold accumulating inside the very walls of the Donghu apartments. Given that the complaints were not heeded and the mold too widespread to counteract, USA Pavilion staff “Refused to pay rent until the mold was removed.” It’s a good thing one of the USAP sponsors was Ecolab, so they could go in and check the rooms for us. Despite complaints and photo evidence of the mold, much of it was scraped off and declared non-hazardous. The finance department was great, getting to learn all the inner workings of a big corporate movie theater-office building. In fact, I have worked in movie theater-office buildings, try Muvico. Many Chinese people have told me that our pavilion is terrible, and from seeing all of the pavilions myself, I agree. The USA Pavilion was just sold to a private buyer, final bid $150 million. How do you turn $60 million into the USA Pavilion, then turn the USA Pavilion into $150 million? And where does it go? According to USAP COO Mark Germyn, it will all go to the State Department. Why? Why do they get this ridiculously large sum when the Federal gov gave not a penny? The State Department doesn’t own the USA Pavilion. It’s owned by a private nonprofit, Shanghai Expo 2010, Inc. Where is news about the sale available? Where did Germyn make his comments? Thanks for the tip. I don’t know if it’s available information in any kind of release, but I heard it directly from him and so did a friend of mine. When the Expo started, they said that the State Department was going to “Borrow” the pavilion for 6 months. I guess during the borrow time it was sold so they can have the money. The State Dept. is going to distribute the $150 million to charity maybe. The petition that Elias includes in his article was indeed the product of 6 to 8 individuals, and does not express the viewpoints of all of the SAs. Most of this petition and the drive beyond the “justice movement” was based off of hearsay and rumor. No one ever provided documentation or hard evidence that other pavilions were paying their SA equivalents “western wages.” The bit about paying Diploma folks slave labor wages also has that symptom. These “brave individuals” behind the petition and the drive to “expose the USA Pavilion for what it was” are no saints – they, too, manipulated numbers and pushed many susceptible SAs into complying with their viewpoint. Some of the same folks that are complaining about not getting access to meet celebrities and important officials were the ones that tried to hide it from other SAs that they were invited to a private party with Miss USA. Real mature. Where was all this talk of fiscal responbility and not knowing where the money trail was leading when we were thrown a huge July 4th bash at the pavilion? The whole thing screams “entitlement.” I won’t sit here and say that I was upset when we did receive the compensation at the end of July. Of course, I accepted the money…it made sense for us to get equal wages that were going to be paid to the second session of SAs. But using slander and manipulating facts doesn’t make you a hero, it exposes you as a weak constituent. It is no surprise that no one in this forum has mentioned Adam Minter’s “other” article that highlighted the student ambassador program as a unique pavilion feature that separated it from many of the other pavilions that didn’t have chinese speaking nationals. I don’t think that it was the job of the USA Pavilion to ensure that each of the 160 Student Ambassadors had the experience of a lifetime. That was up to each of us as individuals. The Expo may not have been what we expected. The USA Pavilion may not have been what we expected, and even the jobs that we were assigned were different than what we expected. But you know, we were flown, for free I might add, across the world to be part of an extremely important time in China’s history. I was a member of the protocol team, but it wasn’t only because of that that my time in Shanghai was fulfilling. I made friends from all over China and the world because I knew that we were in China at a very important and unique time. I actively sought out my own opportunities. That’s where my energy was exerted. We knew good and well that being an SA wasn’t going to make me us millionaires. The experience was about our futures. I will always look back on my time at the USA Pavilion as one of the most fun and fulfilling times of my life. An impassioned cry for honesty on behalf of people who didn’t practice it. Listen, the SAs were an eleventh-hour save for a pavilion that obviously was going nowhere as far as appealing to anyone other than its corporate owners were concerned. They were a lucky hit. Moreover, they demonstrated that with the right conceptualization and planning, a pavilion costing $30 million — which could easily have been funded by Congress, providing all the staff and SAs with living wages — would have sufficed. However, this was not to be. We know from documentation that the pavilion was fated to be privatized from Day One. And once again, privatization didn’t work. The pavilion is the type of virtual commons that if you fence it off a la the Enclosure Laws, it ceases to project either energy or good will. You don’t make something American merely by tacking “USA” on it. “American” means a whole lot of things besides corporate advertising and self-promotion. The SAs came into this situation in the last half of the third year of this melodrama. I don’t doubt that their experiences were mixed, nor that they made a positive contribution to the pavilion. That doesn’t negate the objective conditions that produced a lot of discord and dissonance among many if not most SAs, nor the importance of their story. They’re just resonating to a whole lot of negative energy emanating from this effort, energy produced on a regular basis before they arrived. It’s interesting that a survey by Shanghai Jiao Tong University, reported on in Shanghai Daily, discovered that the majority of Chinese visitors also resonated to this negative energy, so much so that they judged the “USA” pavilion the most disappointing national pavilion at the Expo. Even the SAs couldn’t save it. Too bad it wasn’t really national. …And like someone asked earler: where’s all that money going now? If it’s ok and not hypocritical, I would like to agree with some of Dan’s points and assist him in defending certain aspects. On the other hand, Entertainment dept. employees (who staffed the July 4th party) and many staff members were very overworked and extremely underpaid compared with what the executives made. I think everyone will agree that our pavilion should not have a $60 million price tag, especially considering many construction materials, supplies from Wal-Mart like televisions and washing machines, and plane tickets, etc. were donated and not bought with money. Also, many items that were donated (i.e. wine from E.J. Gallo) were sold for money which was shared between USAP and IVG (a seemingly for profit contractor). Still there is no explanation for why the government should receive a penny. They did not pay any staff salaries or contribute funds. Interesting? 2) This piece does not seek to discredit Commissioner General Villareal . The footnotes from the original MsWord document were not included in the post on this website.. In person, Commissioner General Villarreal listens to others with great interest and is quick to smile and joke even in the most formal circumstances. His personal disposition and cheery Texas accent makes him a favorable diplomat when dealing with the most stuffy of government dignitaries as well as common Chinese visitors. It should be noted that this article seeks, by no means, to defame José Villarreal, as he treated Student Ambassadors with dignity, a quality greatly lacking among certain departments and senior staff. 2 Note these are estimated figures and are highly inflated. But all together the numbers are unrealistic when looking at the actual end product. $23 million figure for the “Show Construction and Installation” refers to 3 short films, none of which are of exceptional quality. Where did this money go? If you’d like me to add some footnotes to the post, that’s no problem. Send them to me at charlie @ chengduliving.com and I’ll take care of it. We both had privileged positions at the USAP. I was essentially a “sound guy” and spent most of the days working on EXPO accreditation forms for performers or running Dance America Shows. Additionally, I helped set-up PA systems for various bands and choir performances. Neither you nor I spent 10 hours in 40 degree summer heat saying “Ni Hao” to 30,000 visitors. There was an evident hierarchy and classism that evolved within the SA program, the “office” vs. “operations” dichotomy. I was a fly on the wall for the whole “uprising” as my situation wasn’t comparable to that of other SAs. The exception being National week, when I worked over 50 hours and almost fainted while running mic lines under the stage. I didn’t expect to become rich either; I accepted the position when it was listed as an $18 a day stipend. After spending a year volunteering in the aftermath of the 2008 Sichuan earthquake, I was eager to return to China, a place I have grown to love. I was happy to accept the internship as a way to get back into China and to work for the US under the umbrella of environmental sustainability, as the “Better City Better Life” theme of the EXPO was supposed to entail. The invisible paper trail of USAP finances made it only possible for the members of the petition group to base figures on conversation with other workers. Surely neither Mark Germyn, nor the head of finance was eager to answer the ubiquitous question, “Where was all the money going? And perhaps the operations workers were too tired to visit and investigate other pavilions to document their salaries. After a 10 hour shift, most SAs just wanted to board the bus and head back home, I know I did. By the same token, very few SAs took the initiative to visit pavilions on their days off, as all they wanted was an escape from EXPO. And I agree that Adam Minter’s post on SA’s is fanstastic. But look at the commentary, everyone agrees that they are the only redeeming and “American” part of the pavilion. Moreover, both Katie and Ryan were part of the SA working group and signed, the petition, so this makes them outliers? Or just honest Americans? Yea operations folks did work hard during their days, and there is validity to some of the grievance they listed. Too tired? I guess if I were going to accuse people of laundering money and corruption, I would’ve worked a little harder to make sure that I was right. The problem that I have is fingers were carelessly pointed at people that we had all worked alongside for the entire summer. And I thought it was interesting that more than a couple of the leaders of the finger pointing were the ones that tried to leave early – some over a week – and take their reimbursement in tow. I feel like Caleb led the process before the serious negotiation, Katie (especially) and Ryan spearheaded the meetings and were the most vocal of the group. They were also both eager to drop “Health issue reimbursement” from the list of issues to bring up. As a first session Student Ambassador of the USA Pavilion, I would like to offer an alternate view of my experiences. I cannot comment on the finances associated with the USAP, but what I can say is that my experience as an SA was fulfilling, educational, and unique that was only augmented by my interactions with State Department officials. Deputy Commissioner General, Tom Cooney, especially took the time to speak with SAs regarding their experiences. Towards the end of session one, he offered his time to speak about his career in the Foreign Service with any interested SAs. After the talk, he was available to take questions and give guidance. Contrary to what has been commented on this post, I believe that Deputy CG Cooney made a significant effort to ensure that both staff and SAs were not mis-treated. Furthermore, State Department officials actively organized community outreach events for the USAP. Various volunteer activities were made available to SAs. Of the activities, I volunteered along with five other – from the Protocol, Operations, VIP, and Communications departments – to speak to a group of thirty Chinese high school students. It was an opportunity for us to share our personal experiences representing the USA. For SAs who felt their assigned roles were not essential to the USAP, it was a chance to have one-on-one conversations and truly influence visitors. I concur that many aspects of the USAP required amending. I was fortunate to have worked in both the entertainment and protocol departments and got a taste of Operations during the soft-opening, where I was berated by unsatisfied visitors. However, the management at USAP did take into consideration the suggestions of SAs and, as a result, instituted a rotational system for the second session SAs. I believe that staff and SAs exceeded what was required of them because they knew their work and their presence had an impact on visitors to the expo. I left the USAP enthusiastic and honored to have been a part of the experience. From the application process all the way through training, I had no clue how I would be serving as a Student Ambassador. Eventually, I found out I was going to work in operations, running movies, talking about the movies and queue management. Little did I know, my summer as a Student Ambassador was going to consist of being yelled and pushed at by Chinese people in the Shanghai summer heat, while several co-workers would be sitting in air conditioned offices meeting and greeting VIPs or gaining real world applicable experience. We all had important roles to fulfill, and I’m not complaining, but the experiences were completely different. Would I have done it again? Yes. The opportunity to represent my country was something I couldn’t pass up. The pavilion itself was quite a disgrace. The USAP was merely advertising space for corporate America. The SA program was the only genuine thing about the pavilion, we played an important role in putting a face to America. I was one of many to sign the petition, but the information wasn’t manipulated. I had come to all the conclusions in the petition before even having read it or having talked to anyone involved. This naturally led me to sign on. I miss Shanghai, the people I worked with, and some of the great people I met. However, the expo experience itself was unpleasant. I was sad to leave Shanghai, but delighted to leave the expo. I’d make the argument that protocol were true “student ambassadors”, surely your experiences were set aside from the rest. But I know you all worked very very very hard. Certainly it would be incredibly enriching to meet with heads of state and representatives and heads of fortune 500 companies. As for Tom Cooney, I never met the guy, not sure how many SAs did aside from those in protocol. I’m not qualified to form any sort of opinion from his phantom role. With regards to community outreach, I’d argue they were largely well-planned photo-ops, “feel-good” experiences for both parties. By the same token, after the 2008 Sichuan earthquake some Chinese and foreigners would come to the earthquake area, hand out candy, play with kids, take photos and go home. Sure a nice showing of face, but not exactly a sustainable commitment to philanthropy or social change. I took part in the USAP trip to paint a school for the children of migrant families. Overall it was a great experience, I wear my white paint speckled hiking boots with pride. This was a good effort to promote American values of compassion and working together to make change. Growing up in an 1870’s farmhouse I know that paint peels rather quickly. Surely we made a difference on the surface, but the US could have done a LOT more to promote global citizenship and positive US-Sino relations. The faux 4-D Act 2 Movie, featuring the child actor Rain, which showed a privileged caucasian girl uniting a community of color through a community garden. Community gardens in America, are largely part of alternative rather than mainstream culture. Community gardens are often spearheaded by: people of color, environmentalists, people that identify themselves as GLBTQ, squatters, aging hippies and those who object world food policy dictated by the WTO and IMF. These people fight to reclaim public space for the greater good but often shut down by the police and gov. who cite ridiculous zoning laws aimed to protect the interests of private property and capitalism rather than the well-being of the people. The means in which the first director of Community Outreach and Cultural programming was “terminated” from her position, is worth investigating. Elias, you don’t want to open that “former Cultural Outreach Director” can of worms. Anyone within a 10km radius of that breach of contract knows how inappropriate it was. And you know what contract I am talking about–the one you signed, to work for the USA Pavilion. My comments are from an operations perspective. My desire in writing is to seek for and reach more balanced understanding and civility. Thank you Emily Yu and Dan Redford for your additional perspectives, which help provide a more complete picture of the spectrum of experiences at the USA Pavilion this summer. I know of no official poll but I personally believe that most of us Student Ambassadors experienced a continually challenging, richly rewarding, and deeply educational internship. This summer was a dream come true for me: an opportunity to represent the United States among the Chinese people. The USA Pavilion exceeded my personal expectations in every aspect. Working the fast access lane in operations, I welcomed guests from all walks of life to the Pavilion. Interacting with young and old, both rich and poor, deepened my love for the Chinese people — their culture, their honor, their language, their history, their goodness. Learning about other people does not come from constant complaint nor focusing on what is absent from our own personal lives. Look above the people pushing, shoving, yelling, and spitting, relieving themselves in the acts, and otherwise. Ignore the heat of the day. Stretch yourself to do more and become more than is asked of you. Manage your personal finances in a responsible manner. Find ways to enrich your life and the lives of those around you. Learn every day. Are these not elements of a fulfilling global internship experience? What many Americans fail to understand about the USA Pavilion at Shanghai World Expo is that the show was not catered to the tastes and viewing pleasure of Americans. Rather, the show was created within the confines of a message appropriate to portray the United States at a world’s fair in China. This year, Expo wasn’t in Europe. It wasn’t held in a democratic country. The message was created to show a portion of who we are and what we believe in to the Chinese guests. Whenever I brought friends to Expo and the USA Pavilion, I invited them to ponder two questions throughout their Expo experience. First, what was the Chinese government trying to tell the Chinese people through the Shanghai World Expo? Second, what would I get out of Expo if I were a Chinese national guest? How would my perspective of the world, of China, and of myself be affected as a result of having attended Expo? Many Americans visited the Pavilion and were disappointed with what they saw and experienced. But they didn’t view the Pavilion as Chinese nationals. They saw the Pavilion as American citizens. The target audience of the Shanghai World Expo, contrary to expatriates continued belief, was not foreigners. Rather, World Expos primarily target the national citizens of the host country. In my mind, the success of the USA Pavilion at the Shanghai World Expo is measured best in the individual lives of guests who came and saw Americans for what we believe in and who we are in a different light. Their perspectives were broadened. Their vision was elevated. As they walked away after the show, guests saw us in a way they had not seen when they first stepped in line to visit the Pavilion. Witnessing that change taught me that public diplomacy is not merely something to believe in. Rather, I learned that public diplomacy is an attitude we live daily. May we live this attitude of understanding and action as we move forward in positively influencing our communities and nation. Very well said Ben, I really appreciate it. It really helps to think about looking above the crazy frenzy we had to experience. The perspective you shared is definitely the attitude we SA’s have to constantly remind ourselves without stressing ourselves out at work. Let’s be honest here — The USA Pavilion did not have an easy start. I am not referring to just the raising of money, the criticisms the Pavilion received abroad, mostly from the U.S., but also the challenges faced on the operations side. Although I was only a part of the pavilion for 6 months, the first couple of months were difficult. There were a bunch of individuals, staff of all levels and interns alike, who only wanted to complain and were disgruntled by their first week at the Pavilion. We must ask, as a start-up six-month existence non-profit organization, what are the expectations many of us are holding? When I first came on board in April as a first-session Student Ambassador, I would be lying if I said I wasn’t confused about what I was getting myself into. But I knew I wasn’t alone—everyone was confused, no one truly knew what to expect of Expo or the Pavilion. I was assigned to be a Student Ambassador working for the VIP Suite Operations. Sure, the attendance was nothing like the staff had expected. But that didn’t take away for me the opportunity to become close friends with the Chinese staff who were a part of the subcontracted IVG group, as well as the The Executive Centre Chinese receptionists. And sure, I was getting paid peanuts, but we all signed onto the project knowing what we would be getting paid. Plus, we had a sweet apartment and sponsored flights to and from the States. I came into this project knowing it was an internship, and was ready to work in whatever capacity the Pavilion needed me to. Within a month or so, I transferred down to work on ground floor operations. Working in Operations wasn’t easy—it required the ability to see beyond what was in front of you: the rowdy visitors, the children who couldn’t control their bladders. Some of my colleagues had a tough time seeing beyond those aspects, and therefore made the experience miserable for themselves. There were days when I, too, had a hard time seeing the huge impact I was having on the thousands of visitors I interacted with each day. There were days when the weather was too hot out, or too cold inside the Pavilion, or I was met with a visitor who totally disrespected me. But I realized that I was truly an Ambassador, a representation of the United States to many people who may never ever have the opportunity to visit the USA, or to even meet another American. I am engaging in public diplomacy head-on. What an awesome opportunity! After my extremely positive experience the first three and a half months at the Pavilion, I decided to apply as a staff member to be a part of this project until the very end of Expo. I wasn’t planning to, but I knew I couldn’t pull myself away from this public-private Pavilion which came together in such a unique way to represent the USA. As a member of the Communications team, I’ve read a number of critical articles about the “cold, corporate pavilion”. My personal experience has been that Chinese visitors – who the pavilion was made for in the first place – either applauded our Sponsors’ participation or did not even notice the corporate presence. If the Chinese visitors can see it as a positive aspect of the pavilion, why are we as Americans being so critical of our own pavilion? The Chinese visitors see the pavilion’s presence as their opportunity to meet an American friend, to learn about a country that they don’t fully understand as of yet. What did the Chinese people learning about America? 1) WE ARE FRIENDLY—from the Friendly American Student Ambassadors greeting them at the queue and turnstiles in, at one point, 38 degree Celsius weather to the Pavilion’s SAs shows to them, sometimes with jokes and other times with song, dance, or rap; 2) WE REACH OUT—from the talented Dance America group who performed on our stage day in and day out, and even ventured out to other cities and provinces to bring a slice of American culture to them, to the cultural exchanges with different provincial pavilions where our Student Ambassadors had the opportunity to work with people from Inner Mongolia, Sichuan, and Jiangsu province, as well as the digital platforms we had to reach out to netizens who could not physically visit the Pavilion; 3) WE CARE ABOUT THE COMMUNITY AND VOLUNTEERISM – from the weekly Kiddie Korners, where disadvantaged kids had an opportunity to learn about America and have a VIP tour of our Pavilion, to the 3-day Habitat for Humanity build in Pinghu, Zhejiang, where Student Ambassadors, Staff, members of the Consulate, all joined together. So you see, the USA Pavilion was not just a pavilion, but it was made up of over 300 outstanding individuals who came together to be a part of a team doing something greater than they could ever imagine. I am extremely proud to have been a part of the USA Pavilion, although I came on the project considerably late compared to many others. I am seeing more and more the amazing opportunity we’ve had as Student Ambassadors and Staff, not only to impact the visitors of our pavilion, but also all the people we’ve met, Chinese or from another country. In addition, we had the privilege to work alongside an amazing team of experienced individuals, not only the members of senior management at the pavilion and the talented members of the Consulate like Tom Cooney, but also the fresh and friendly mid- to lower-level staff. Every single person played an important role in people-to-people diplomacy, and I vouch to say critics are jealous they did not seize their opportunity to do so. I am extremely grateful for the people I came to know, including those I only had an opportunity to meet on the big screen – such as Secretary of State Clinton and President Obama. This project was extremely successful, and I challenge all critics to do something even remotely amazing for America. With 7.3 million visitors by the end of Expo, and the ability to work together with successful men and women I can now call my mentors and friends—what more could one ask for? 1) It’s misinformed: I don’t know all the facts and all the numbers, and I am still trying to understand this huge project after 6 months of being a part of it, but a lot of the information up there just isn’t true. Many of the student ambassadors, including myself, found ourselves to be bullied into signing this so-called petition with no recommendations for making any sort of resolutions. Instead, it was a laundry-list of grievances, with nothing positive to say. It was extremely biased. Although there were a couple of valid points, i.e. we didn’t receive information about what our jobs would be (but did anyone REALLY know that?) and that we didn’t learn about the staff cafeteria until pretty late in the game (AGAIN.. why would the USA Pavilion PURPOSELY withhold this sort of information?). But here are some truths: firstly, the petition was not really met with “extreme enthusiasm”. secondly, the petition was never presented to management.. why? because a good number of students did not feel comfortable with the fact they had signed the petition. thirdly, the Working Group was NOT created subsequent the petition, but was something that was created somewhere much closer to the beginning of Expo (the petition really did not accomplish anything). There was a forum that addressed all the issues brought up in the petition. Ecolab checked out all the Expo Village apartments and found that there were no signs of mold. 2) For people like Elias, who stayed until the end of their contract, it just blows my mind that an article such as this could be written about the USA Pavilion. If their experience was truly as bad as it seems, then they should have left early. They should have “protested” the stipend they were receiving weekly, left the Expo Village apartments they were living in, and skipped work at the pavilion. From what I remember, the handful of “vocal” student ambassadors stayed for the entire duration of their contract. Explain that. Thank you Dan, Emily, and Ben for sharing about your positive experiences at the Pavilion. Bob Jacobson and Elias Whitman: you guys have seriously got to stop pigging back off of each other’s conspiracy theories. What’s not unique about your entries is that they are 1) obviously mudracking, 2) factually questionable, 3) in poor form, and 4) lacking in perspective. I also grew out of the Student Ambassador forum. Because I invested myself in the program, working without breaks for days on end, I was hired on as staff and then promoted again to an executive assistant position. I excelled in this complicated team, because I saw the problems and surmounted those challenges. Not once did I complain about the sponsored housing and money. Because in this 21st century of intense competition, free lunches are only available when you’re trying to advance your career by learning something from a mentor. And when you’re 22, those lunches are rarer by the day. I seriously cannot tell what you two are trying to gain from these diatribes: if you were looking for free lunches, those are out of the question now. Are you looking for more money, fame, and power? Because if you are, I’d suggest being a part of the Yeosu 2012 planning committee, where you could put your “expertise” to good use and help solve problems for future Expos. I’m 22 and I think that these arguments are a waste of everyone’s time and resources. USAP 2010 is wrapping up. People want to visit their families, look for jobs. Maybe even take a little time off–those who have that liberty. 1. The vigorous defense of Tom Cooney, the ultimate State Department careerist. We all know that tom is waiting for his big chance to be named a CG to a middling post somewhere in Asia. Odds are, though, that his reputation was damaged so badly by this BS pavilion especially amongst politicals (trust me I know) that he’s going to be looking back on this moment as his career peak. 2. The spin that American critics of the pavilion don’t understand it because THEY’RE NOT CHINESE. Well I think we all know that the USAP paid Fudan University to study how great the pavilion was – and LO AND BEHOLD – Fudan said it was terrific. But the problem is that Jiaotong University, which was not paid by the USAP, polled it as the MOST DISAPPOINTING PAVILION at the Expo. Now which study should be we believe? The one paid for by the USAP? By the way – what’s the chance that Tom Cooney will put that on his resume: Deputy CG, the Most Disappointing Pavilion at the Expo. I’d bet serious zhlotys that the sweeping PR response to this post means that somebody at the USAP is worried. And they should be. Where’d the money go? Here’s one theory: it went to pay off all the meals that Mark Gerwyn and his squeeze Nancy were charging all over town on behalf of the USAP. Any takers? Spineless anon writer, at least make public your name. This argument is already trivial enough as it is. Your conspiracy theories are as ridiculous as your personal attacks. You might consider, Rune, that people’s reputations and livelihoods have actually been threatened as a result of writing about the “USA” pavilion situation. Your claim that “USAP Observer” is issuing conspiracy theories is baseless, unless you can prove that there was no collusion to create a pavilion that ultimately failed on most counts. You can’t, because the facts are on “USAP Observer’s” side. Read some of the published accounts in other journals. Bob, I can easily consider that harsh things have been said to individuals like yourself who have not only slandered people’s names but also tried to pass off conspiracy as facts. What I’m having difficulty considering is protracting any kind of argument or discussion with you, so I’m going to–as you will see at the end of my reply–provide a chance for us to see you help the USA do better next time. If you were in the position of executing USA Pavilion at Expo 2010, what would you specifically done differently to avoid problems you see, make the USA Pavilion a success, and how would you have specifically defined–then measured–this success? That’s all covered in my six articles posted on the Huffington Post, including proposed solutions which are now being considered by the Congress. Please read them for the answers to your questions. The index is at http://huffingtonpost.com/bob-jacobson/. The last three posts prior to “USAP Observer” conflate the comments of Elias with my own. Elias is speaking primarily to the experiences of many of the student ambassadors. I have heard both stories, the good and the bad. Individual experiences differ. So what else is new? The fact that many SAs had a bad time is worth noting, ironically, principally because the “USA” pavilion’s public relations team, the pavilion’s management, and even the Commissioner General didn’t report it sooner. That’s indicative of how this event was handled, not just to give the Chinese a good show but also to avoid disclosing much about what was happening in Shanghai to the American people back home. The SAs’ experience occurred in the last half of the third year of pavilion-related politics, business, diplomacy — or its absence — and finally, operations. While the individuals involved find it front and center, it’s not the big story that will reverberate as people take a closer look at the whole operation. There’s no need for me to rely on Elias’ account to make a pretty good case that the “USA” pavilion effort was flawed from start to finish, or to claim a conspiracy existed. A racket is more like it. Elias’ account and the accounts of others who have published here and who have contacted me separately are simply manifestations of a derelict management based on the fact that the whole operation was scammy. I applaud the SAs in general for rising about the overall yuck, in effect pulling out a slight “win” for an effort in which perhaps $100 million was raised but obviously not applied effectively (or applied at all — no one has seen the books for this slush fund except the owners and the management). But the general slackness of management derive from an overall ethical lapse that began with the Bush Administration subverting normal procurement rules and Expo traditions to outsource the pavilion to private owners without qualifications or experience. Once that error was made, all else that followed was almost inevitable. Where do you even get the idea in the first place that “many SAs” had a bad time? From the misinformation of this article? I resent that you would say that my comment, along with my fellow SAs comments, somehow “conflates” yours and Elias’ comments. The positive (and the few, negative) experiences we’ve had are, as you state, individual. However, there are simply false statements that are brought up in this article. You’re right, people are entitled to their own thoughts, comments and experiences, but when there is clearly misinformation about how things went down and what the numbers were, someone needs to rebuttal those. I get the feeling that you are trying to use Elias’ account to support your own conspiracies regarding the pavilion, members of the consulate, and the Obama and Bush administrations. Except now you are realizing that there are actually “many SAs” who had extremely positive experiences. You’re entitled to your own opinions as well, but until you can make a true, factual statement about the Pavilion, everything you say is mere conspiracy, and this discussion is pointless. Same message goes for those anonymous writers. I would like to see all of Mark Gerwyn’s USAP credit card receipts forwarded to the IRS. Then we can have a factual discussion about he and Nancy. Please have the courage to stop being passive aggressive with your comments, anon writers. Rune Huang, you’ve threatened one poster and questioned the authenticity of many others who’ve chosen to respond anonymously (maybe to avoid the same fate). But you’ve so far done the same, coming on as just another SA. So let’s set the record straight. Your LinkedIn profile indicates that you were Communications Coordinator for the pavilion for several months and then Assistant to the CEO/President of Shanghai Expo 2010, Inc., the private owner of the “USA” pavilion. That makes you management. Or to invoke a bit of American culture that didn’t get mentioned in the movies, a house slave. Shanghai Expo 2010, Inc., management to frequent shot off its mouth (and its foot) over the last several years and it’s gotten it into trouble. Immersed in that corporate culture, you might do the same. Or, you might learn to be a better manager by listening to your “employees” concerns rather than chastising them. Remember, Rune: what you say online doesn’t stay online. @ Bob, you are chronically over-posting on this page. Why do you feel it necessary to respond and argue with every SA? They worked there, I want to here from them. And I’d like to address the “false statements” in this article. I’m not trying to piss you guys off, I know many of you are angry at me, you all worked very hard, I’m just writing what I witnessed. Had I been exploited as bad as the folks in Operations, I would have tried to organized a strike. The classism of the SA program placed me in pretty decent position, where I could put my sound engineering and music skills to work. And it is admirable for the folks that stuck around for the entire 6 months, that takes serious perseverance. Elias, thank you for your aesthetic poke. I trust you’ll extend the same courtesy to the insulters, misrepresenters, and arm-twisters in these Comments. It seems there are many of us “chronic” posters here. Elias, what I find ironic is that you’re trying to champion a cause here concerning exploitation of your peer colleagues, yet at the time you did not even try to take leadership on any of these issues. Matt credits himself for coming up with the idea of the Working Group. Caleb is recognized as the creator of a draft that was viewed by certain individuals in the Student Ambassador program. Ryan and Katie created a list of demands for senior management. You were not present at the meeting with senior management on that list of demands. When there was a real effort to address issues, you were not there. Now, you do not gain more credibility by spreading false information over the Internet and tangling yourself, as well as your peers, with Bob. You’ve been using too much rally-around-the-flag, bleeding heart rhetoric–rhetoric that parrot’s Bob’s–for your readers to not assume that you have some kind of agenda. I am not accusing you of colluding with Bob, but I am pointing out how pointless your unbalanced article is. You’re shooting yourself in the foot and misrepresenting your peers and colleagues. If you really wanted to make a difference, you’d get everyone to work together and to show all sides of the story in an objective and professional way–not just this rally-around-the-flag, bleeding heart rhetoric. In the spirit of the Stewart and Colbert rally in DC last week, let me say that I’m somewhat angered by this extreme display of anger. You avoid reality, are oversensitive, and enjoy demeaning people who do not agree with you. I therefore explicitly call into question your authenticity, credibility, and expertise. You have an agenda: you failed at bidding for the project, and you want the throats of anyone who was part of it because you couldn’t be there. How ironic, Bob Jacobson, that you should accuse others of crimes only you commit. You have nothing but conspiratorial essays to present, and if you really had a plan, you would be able to show everyone a succinct list of steps. Sir, you put the burden of proof on yourself for a better plan. Prove that your ideas work. P.S. How many of these anonymous postings belong to you? Rune, that is the oldest slander that the Shanghai Expo 2010, Inc., and its compadres has passed off for the last two years. That’s stupid. I got over our team of Expo veterans having the rug pulled out from under us, after we “won” the pavilion RFP process, long ago. That’s just the way villains do it and if you dwell on such nefariousness too long, it addles you. So get off it. Second none of the anonymous postings belong to me. I got over that too, long ago. I have no reason to be scared of you, as you have of being scared of me, because I have the facts and you know it. My essays are not conspiratorial. Let’s cut to the chase: the pavilion effort as conceived by your bosses was apparently a racket as in a RICO racket. Your company allegedly lied it’s way to a tax exempt status and invited the corporations to set its agenda. All this is published. It requires no invention on my part. I’m not sure what reality you live in, but I don’t avoid it. That’s another stupid claim. We’re adults, Rune: we need to rise above playground insults. The second part of my plan accompanies the complaint making its way through government agencies and the Congress. No, I won’t share that with you, because you would only abuse my trust. It’s available to those who don’t read with a search-and-destroy agenda. Just click on my name above and I’ll share the basics. Lastly, in response to your earlier threat to Elias: that’s on the record. When I figure out what it means, it goes into the journalistic cloud of which I’m a generally welcome member. Think twice before accusing me of slander. You don’t know what I know. You could come off looking very silly, my boy. Oh yeah, what do I want now? I want to get back for the American taxpayers the revenues owed by a six-month corporate infomercial, revenues that we (including you) otherwise will have to make up. That’s fair, don’t you think? PS I have a proposal, Rune. If you shut up, so will I. That is, unless you post again under an anonymous handle or have a cowed minion speak for you. You bully. Bob Jacobson, I am busy with work. I know that when I leave this forum after this post, you will continue to wave your flag and go on with your identity as a pseudo-journalist. I do not appreciate how you will twist my words to fit your agenda. Let me know if you find out who shot JFK. Looks like Bob is becoming a bit defensive in taking up the cause of saving the tax revenues the U.S. government could have collected. Calling names, telling Rune to shut up. You know why? Because he’s doing this for money. He can get money out of this and wants to hear bad things to fill his pocket with the money he’s saying our bosses took from the American taxpayers. Mr. Righteous save the country’s money is trying to get some too. I feel like I would be selling out if I helped him, and I told him so already. Making his name famous and selling books seems pretty self-righteous. That’s why siding with management is being complicit, because he needs cooperation. Mcash, what in the world are you talking about? On what basis do you make your allegations? I want to be famous? I am famous. My career has gone just fine. You’re the one starting out and you just shot yourself in the heart. I’m not a 22-year-old naif. I’m a mature citizen who is righteously indignant that his government and corporate cronies have taken advantage of us, the American people. That you’re not is disappointing. As for my motives — not that I want to do this once again, but you’ve made aspersions and as we learned from John Kerry and the Swiftboaters, one must respond to aspersions — had you read my Huffpo postings, you would know that I filed a complaint with the IRS against Shanghai Expo 2010, Inc., in May 2010 when the Expo opened, way before your long-suffering episode as an SA had even begun. I’m now writing an article summarizing the most telling aspects of this affair. Possibly in the future, a book about the debacle. Not to get rich, but because I believe that the American people have a right to know and judge for themselves what’s gone right and wrong with the “USA” pavilion. As for your not wanting to work with or without me, that’s the first I’ve heard from you about it. Oh wait … I did have an email conversation with someone who said he didn’t want to say more than he had already said because he wanted to pay allegiance to his “USA” pavilion keepers — and incidentally, he wanted to protect his reputation and mainly his career. But that person had a name. Was that you? I guess they got to you, huh? Or did you just get the chills? You won’t be making further assertions besides the one you already made, implicating the COO? Don’t worry, your anonymous testimony won’t make a hill of beans. The COO’s actions, if they are as alleged, will be found out by professional investigators. It’s not your fault if he’s declared malfeasant. I feel sorry for you, Mcash. You’ll remember this for the rest of your life. Of course you could recant again, but each time it’s less believable. You get one more turn of the wheel. Think about it. Unless there are more derogations, I’m signing out. The community deserves some peace and quiet. And quite frankly, each time I come in contact with the criminal set or their lackeys, I need time to recover. My parting advice: be informed and think for yourselves. Good luck to all of you and thank you for your hard work in Shanghai. There are three separate issues: (1) the alleged exploitation of pavilion staff, (2) the alleged misappropriation of funds and/or tax improprieties, and (3) the failure of the US to provide a compelling self-representation. The first allegation appears possible, though not terribly shocking if true. The second allegation is quite serious and probably best resolved in the legal realm- where it is evidently being pursued. there is a fourth issue: Bob Jacobson. There are no allegations of tax issues, except those made by Bob Jacobson. Oh spare me this attempted character assassination, piece by piece. It’s like being nibbled to death by goldfish. And as frightening. I believe Hillary was an unwitting pawn in a larger scheme to defraud the IRS and possibly funnel money into the US Chamber’s 2010 midterm elections fund. Would Hillary have raised money for use against her own party if she had known about it? I don’t think so. I have no animus toward the Secretary. I do believe her friendliness toward privatization of government’s public diplomacy functions is unwise. But that’s a policy disagreement, not a personal disparagement. You do know about disagreeing on policy, don’t you? It’s called democracy. PS How come you guys are always anonymous? Haven’t you got the conviction of your ludicrous accusations? Real cute, Bob. First you smear Hillary on Daily Kos, then you say you have written her and will post her response. So much for presumption of innocence. So much for fair play. So much for ethics. Hi, Anonymous Coward. Nice to see you again. 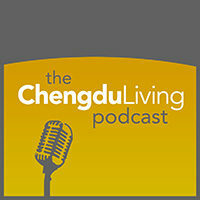 Will our conversations become a regular feature here on Chengdu Living? See, we ARE famous! I hope everyone else reads my article in DailyKos that Coward has posted above. You will see that I haven’t smeared Hillary Clinton at all. In fact, if anything, I empathize with her being given bad advice in her dealings with the private company that ran the pavilion, Shanghai Expo 2010, Inc. Her loyalty to the USA overcame the caution she should have exercised to protect herself — although to be fair, SE 2010 and key units of the State Department had boxed her in. Had Hillary not raised funds in 2009, SE 2010 would have failed and the USA would not be present at the Expo. But by raising the funds, she found herself in the company of snakes. A Catch-22. I didn’t know that writing to the US Secretary of State, to whom State officials referred me, was unfair or unethical; or that a crime has been committed for which there needs to be a presumption of innocence. Unless, Coward, there’s something you want to share with me. Hmmm? Lastly, I’m sorry, Your Highness, that my meager personal accomplishments only merit your scorn. Let me be clear: I’m not famous for my investigative work re the pavilion racket. I do have a satisfying real life and the regard of my professional colleagues. I hope you someday have a real life and colleagues who regard you well, too. Goodbye, Coward, and thank you for writing again. famous people don’t spend their time arguing with college students on blogs. famous people do things of consequence. tell us about your fame, Bob. Most of the comments here are from first-session SAs. I’d like to add a few comments about the second session. Despite some belittling of the SA’s experience as occuring at the end of this whole process (which granted is true), this post was originally largely about SAs, and thus I have no problem sticking to that topic. Second sessions SAs did indeed have have a stipend of about 1200 RMB a week, plus about 400 RMB of credit per month for use at the staff cafeteria. The staff cafeteria, perhaps the only reasonably priced entity at Expo, sold a decently-sized (if somewhat bland) meal for about 10 RMB. Most of the people I talked to found said 400 RMB to be sufficient for the month. I personally found the 1200 stipend, if one lived reasonably, to be more than sufficient, especially given that we did not pay for housing (our apartments were valued at about 17,000 RMB a month), and received many extras in various forms. I’m currently traveling on the remainder of my stipend. Finally, second session SAs rotated through departments, normally spending one month in operations, one in VIP, and one in the office. With the notable exception of Finance, all SAs had to work Operations at one time or another. The Operations schedule also rotated so that we all worked every position eventually. This did much toward breaking down the office-versus-floor divide among SAs, although perhaps less in the case of the divide between SAs and office staff. It also made us better at our jobs, as we understood better how the pavilion worked as a whole. As the weather cooled down, Operations was actually considered by many to be a more desirable department, due to the often shorter and more predictable hours. I worked a month in Protocol, and while that experience taught me many things, I still consider Operations to be the most meaningful work I did in terms of advancing the cause of Sino-American relations. While we in the second session were not in the first session, and thus cannot easily compare, the impression we get is that the second session was overall a much better experience. Part of this, I imagine, owes itself to the efforts of the first session to improve life for their successors. I also think, however, that it also owes itself to the general better functioning of the pavilion in the second session. We were at that point a somewhat more mature operation, and not the startup that we were in the first three months. These comments are fairly narrow. I’m not in a position to say anything useful about the allegations of misuse of funds, corruption, etc. I do believe, however, that such information should be made open and available for public scrutiny. Although the USA Pavilion was a private entity, it still represented the United States, its government, and its citizens, and thus is linked heavily to the public interest. @Pam, bringing lunch to work was the way to go for the first months. Caleb and I would bring in Uighur Naan from time to time. @Antoine, See my addendum, glad to hear about your experience as a 2nd session SA. For what it is worth, I am the one who edited this piece. I edit a lot of content that goes onto this site. If you look at the original version that Elias posted above and this version here, you will see that what I did was basically cut 3000 words that I felt were unnecessary. “There are three separate issues: (1) the alleged exploitation of pavilion staff, (2) the alleged misappropriation of funds and/or tax improprieties, and (3) the failure of the US to provide a compelling self-representation. If anyone wants to attack me for editing this piece such that people talked about it and linked it, feel free, I am far from anon. Sascha, I really appreciated your edits, as the comments in Hao Hao report suggested, length is a key issue. The addendum was for clarification on my experience and to bring SAs back to the focal point. Sascha is making reference to Eli Sweet’s comment that spells out the 3 issues. There are 2 Eli’s that contribute to ChengduLiving hence I’m 3li4s. Sascha and Charlie got people talking about this piece, madd props. First of all, Elias. great article man. In response to some of the earlier posts, I have a few things that I would like to clear up. I was also a student ambassador and, yes, I was a part of that initial 6-8 SA group which met to draft a letter to the USAP management about our concerns. That letter was eventually read and signed by the MAJORITY of student ambassadors working at the pavilion. No one was “coerced” into signing it. Furthermore, nothing that was in the letter was untrue, and there were no accusations or finger pointing concerning a misappropriation of funds. It was simply an outline of real issues concerning standard of living, reasonable compensation, and attending to matters which threatened the health and well being of SAs and other USAP employees. It contained a list of ongoing grievances to real issues. Read the thing! I would also like to add that before the letter could be presented to management, an emergency “SA Forum” was called by the CEO after word of it had spread throughout the pavilion (although he claims he had never heard about it prior to the forum…). Another interesting thing I would like to point out is that, many of the ambassadors who signed the letter and who were most enthusiastic about going to bat for the issues outlined therein were people who worked in the office, entertainment, and the VIP lounge…not only from the ranks of those sweating it out in the stifling Shanghai heat acting as interpreters, security, and crowd control under the heading of “operations.” So, this wasn’t simply the bi-product of corporate politics or jealousy among the ranks. As far as our push for compensation, the word “entitlement” (which was thrown around in an earlier post) is not misused as long as it is properly defined. Were the SAs and other employees (regardless of their nationality) entitled to fair wages in a safe working and living environment? Your damn right we were. Were we entitled to have the freedom to organize and air our grievances? Well, that’s exactly what we did. Here is the other main point: some Chinese workers (read:Diploma) at our pavilion were exploited through low wages, maltreatment, and, in some cases, subjected to verbal abuse by their superiors. No matter how “great of a time” an ambassador may have had, I doubt few, if any, would deny that this was the case. We witnessed it on a daily basis. This is, to me, even more shameful than the inadequate stipends and disrespect that we as ambassadors had to live with. Were there other pavilions who exploited their workers? Yes. Does that make it right that the USA Pavilion did? Absolutely not. As for our “internship” status being an excuse for our low-wages, that argument does not really hold water. The fact is, many of the “student” ambassadors had more education and experience than salaried employees. Furthermore, their language abilities were simply crucial for the everyday running of that pavilion. Had we all gotten up and went on strike they would have had to close the Pavilion. Does that sound like an “intern”? Absolutely not. We were the backbone of the pavilion! I would like everyone to know that, overall, I too feel that I benefited a lot from this experience. I made a lot of friends, learned some valuable lessons, and got to work on my language skills. And, yes, it was great fun enjoying the nightlife with such a fun-loving group of co-workers. I truly feel a bond with the other ambassadors, and I am sure that there are others who feel the same way. However, that does not give us the right to sugar-coat the reality of the situation, or deny that there were some huge mistakes made. Because, in doing so, we are saying that we do not care if these mistakes get made in future Expos. We have to end the corporatism of the U.S.A. Pavilion. Our national representation at future Expos should not be reduced to a marketing opportunity for multi-national corporations. Wal-Mart, Chevron, Yum brands and the like should not be allowed to use the image of our country to promote their own corporate agendas. We can spend billions of tax-payer money on foreign wars, but we cannot fork over a few million for a pavilion that is actually representative of what this country is supposed to be about? Or, if we the people of the United States have simply been reduced to being the brainwashed minions of corporate control, then maybe we should not make a change. We can simply be content with letting the corporations be in charge of handling the way our country’s image is portrayed to millions of people world-wide. I apologize to Elias and the other SAs who wanted to concentrate on the SA experience at the Expo for introducing info about the larger issues of pavilion outsourcing, privatization of public diplomacy, and yes, “greed and corruption” as Charlie headed the article. I keyed on the head and didn’t realize Elias’ intent. Neverthless, I hope you found the other information interesting and perhaps an explanation for why you underwent the travails you did. An experienced Expo team would never have subjected interns to such harsh conditions, nor would you have been forced to learn on the job. An experienced team would have dealt with most of the basics back home (in the USA) in 2009 — but of course, that was not to be given that a totally inexperienced team was chosen to lead the effort. I am pursuing legal recourse to get back taxes owed to the American people. And as Mcash related, I am preparing to do an article and book on the topic — not to get rich, that’s not in the cards, but to bring the larger Expo and pavilion story to the attention of the 349,999,800 Americans who pretty much didn’t even know the Expo was happening. I welcome (in complete confidence) relevant information anyone would like to share for this purpose. My email is [email protected] . PS Elias, it didn’t take $5MM to get a place in the pavilion. Most corps put up $500K, a few a million, a very few $5MM. For those like Yum! who gave $5MM but made many MMs dispensing obesity food to the Chinese visitors, if their take exceeded $5MM, it’s called by the IRS an “excess benefit transaction.” In other words, they owe taxes on everything over $5MM. How’s them chickens! Thanks to all, especially Charlie, for the audience; to those who confided in me privately; and to Elias for his principled stand on your behalf. I’m glad you won. Bob — the Unabobber — cannot seem to move away from trashing others. He complains to the State Dept Inspector General, and the IG dismisses the complaint. He complains to the IRS. And the IRS does not respond at all. Bob trashes the leadership team for “inexperience” but Bob has zero Expo experience from what we can tell. Yet he wanted to run the USAP. So it is not about experience. It is about Bob. Bob — do you personally have Expo experience? Please stop the regular trashing of Bob Jacobson. Let’s respect freedom of speech and let’s keep it civil. We know Bob lost the competition to run the USAP – you don’t have to remind us. We know he has never run a pavilion at an Expo. We know that he went out of his way to criticize and to raise problems for the USAP after he lost, issuing complaints to the State Dept and to the IRS. Many people would just say he is a sore loser. But he has every right to his opinions. And if he has criticism of Hillary Clinton, Condi Rice, and now President Obama – he is free to say his opinions. As Bob mentions, companies could sponsor USAP with a $500,000 donation. What I made reference to was that if companies paid $5 million, (the level of “global sponsor”) they had exclusive privileges in the VIP 1776 suite and prime branding for their logos both on the USAP and in its movies. Thanks for the left-handed defense, “Good Cop,” but it’s not relevant and it’s not necessary. The facts speak for themselves. I’m not into “sour grapes” — that’s an immature posture — but into seeking restitution for an ongoing financial (and political) crime committed against the American people. You know how much is involved? Maybe $30 million in taxes owed. It was sloshing all around you. I didn’t commit the well-documented malfeasances. And the IRS isn’t done with this, nor is the Congress. Justice will run its course. PS Just for the record, since my colleagues don’t deserve to be maligned: our team won the legitimate competition, the RFP. Your bosses never even entered the competition. They “won” the secret, under the table outsourcing by the Bush Administration. I’d say you who defend them are the sore ones, or shall we say, guilty parties? PPS The State Department OIG didn’t dismiss the request for an investigation. He tossed it over to Clinton’s office, a potato a little too hot for a mere Acting IG to handle. It’s still there, waiting…. After filing in November 2009, I made the Request for an Investigation publicly available online for almost a year. I finally took it down to avoid further embarrassment to the Secretary, in hopes that she would respond to it. She hasn’t. In fact, I just wrote to the Secretary’s Office Director, to find out it an acknowledgement might be forthcoming, because it was forwarded to her twice — the second time, in September, in a record half-day. The examiner must have raced through the 20-odd pages with a pogo stick…or maybe his boss just told him to throw it over the Secretary’s transom — quickly! If I hear anything, I’ll let you know here — and in my article — so that you can recall correctly in the future. Pls show us that your team “won the legitimate competition.” Evidence pls. You can read the story, in part, in “A Sorry Spectacle: The uninspiring saga of the United States’ World Expo pavilion in Shanghai,” March 8, 2010, by correspondent Adam Minter. The article is less about the RFP process and more about the shady dealings that resulted in its abrupt termination of the RFP and the subsequent, almost immediate non-competitive issuance of a Letter of Intent (an authorization to raise money, not create and run the pavilion), to Shanghai Expo 2010, Inc., your bosses. I’m still seeking the document authorizing SE 2010 to create the pavilion. So far, it hasn’t been made public, if it exists at all. One might speculate that SE 2010 never actually garnered that authority but went right ahead with money provided by 60+ corporations to build the pavilion, and the Bush Administration just shined it on. Or that the authorization was botched. Or maybe it got misplaced. I would gladly share with you the actual correspondence between the State Department and the BH&L Group, our team — judged the only team qualified by State to create and run the pavilion just before the RFP was aborted — but to do that I would need your authentic name and email address. I don’t deal with masked men. so bob you have no proof. you make an assertion and you can not back it up. you made the claim – not me. you might well dislike me, but your readers deserve some courtesy. pls stand by your assertion and prove you won the rfp. there is nothing in the public record that supports your assertion. the only mask here appears to be the one you are wearing. are you just making things up – or did you really win the rfp? why would you not put the proof on the table? you already change your story in the previous two posts. In the second post you say your team “was the only team qualified” by State. Are both of these statements true? Read my reply again. And again. And again. Until you get it. And stop yammering, Perry Mason. You’re becoming an embarrassment. You write a lot of interesting material bob, and you have a trenchant style. but do you have trouble with the truth? You never won the RFP. In fact you have never been involved with any Pavilion at an Expo. Ever. But why would you lie and claim you won the RFP? You make a lot of serious allegations about corruption, malfeasance, and mismanagement. And you enjoy condescending when you are caught in a lie. It makes you look weak bob — not famous — when you cannot back up your facts. Please read this reply again. And again, And again. Until you get it. I’m not going to dignify your drivel online with a reply. You know the score. However, if you’re man enough to level all these accusations, be man enough to tell us all who you are. Or do you remain a coward? You’ve earned yourself a place in my heart, little fellow. Read the article when it comes out. See ya. Along the lines of Antoine I’d also like to add a few words of my own being a second session Student Ambassador. Prior to interning in Shanghai I was made aware by a few first session SA’s about lack of fairness working at the pavilion. I was told by a Student Ambassador to, “back out” and not work in Shanghai in the coming weeks. I was very confused as I was not fully aware of the situation in Shanghai. The comment was very puzzling, but I decided to work at the pavilion while filtering some amount of heavy criticism from the first sessions SA’s in order to not cloud my own attitude. Working during the second half of expo (July-October) proved to be much different than what the first group experienced. There is a lot of content confronting many aspects the first round appeared to have experienced. Many of them are alarming. I do sympathize with the struggles you have faced, and it does seem really unjust for all of you to have gone through that. I can only have a certain amount of bias as I was not apart of the first group. Though, I have to be sincerely grateful to all the first session students who were brave to present their issues to the higher levels. With your input, my experience as an SA was much much smoother. I owe this experience to all the first session SA’s who paved the rocky bumps and the challenges. Thank You all. However, that is not to say second session SA’s faced challenges in the workplace, especially working in operations, but I feel they are fairly minor compared to what first group unfortunately had to experience. Many of the comments I see are pretty biased, and I see a lot of back and forth responses from many parties that need to be toned down. We can all participate and voice our opinions without being too charged. Name calling is not appreciated, nor tolerated. If people want to be anonymous, so let them; it’s their choice. Is that a crime? You can be anonymous and make charges, but when you disparage individuals and do so anonymously, you’re engaging in slander. Attacking individuals without providing evidence is the meaning of the term. the only person not providing evidence is bob jacobson. he says he won the rfp – no evidence. he says he was best qualified – no evidence. he says “i am famous.” – let’s just politely say there is no evidence. More slander. The evidence has been provided. The anonymous individual posting these memos is a sad coward. As I wrote earlier, all of the RFP-related data is available on the record or from me. Just tap on my name to request it. As for my “fame,” my peers know and respect me, which is all I can ask. Bob – I’ll break it down for you. So we ignore for this discussion that you probably mean “defamation” rather than slander. There is someone who is making untruthful statements about you, bob, and they might be harming your reputation. For example, there is someone claiming you won the RFP – that is a straight-out lie. It certainly damages your reputation. There is someone claiming you were the “best qualified” team for the Expo. That appears to be a lie as well, though you claim you have the proof but you just cannot share it. Just like Nixon’s secret plan to end the Vietnam War and just like Sen. Joe McCarthy’s list of communists. You have the proof, but it is a secret. That approach certainly damages your reputation. We cannot at this point definitively say you are lying but we can fairly make the claim that most people who tell the truth do not go through funny moves to hide the proof. And there is even someone out there claiming you are famous – a statement which much expose you to no end of ridicule. Finally, you criticize anonymous postings. Yet you have your own anonymous post at the Daily Kos. So we have established that you are not only a liar, but you are a hypocrite as well. Careful, Bob, that isn’t defamation – it is just the truth. Unfortunately, bob, the person making these defamatory comments is You. No one has hurt your reputation more than you have. To the Readers: This is my last word in reply to this nincompoop’s babble. 1. Actually, I mean libel: disparaging someone unfairly in print. If this person would reveal his or her identity, I might bring an action for libel. Fearful, he or she stays anonymous. Pathetic. 2. The letters stating my team’s sole qualification as best qualified to create the US Pavilion per the terms of State’s 2006-7 RFP are public documents, easily obtained. Or ask me for a copy. 3. Daily Kos publishes all postings using handles. Click on my DK handle and you get my profile complete with name, LinkedIn profile URL, and email address. With this sad display of how a perp attempts to divert attention from a crime with irrelevant comments about others, this conversation is over. we’re going around in circles bob. you have the proof of how great you are. but you will not release it or post it. now you change your story. the statements that you are “best qualified” are simply your letters. Not the State Dept. Not an independent body. Just you saying how great you are. Just like you saying you are famous. Bob – you have been caught in your own lies. You never won the RFP. The State Dept never said you were best qualified. So on Planet Bob you won the RFP and you are best qualified. For all we know, you won the Oscar and the Pulitzer Prize. And on Planet Bob you are certainly famous. But here on Planet Earth, you did not win anything. And you were not best qualified. can we please avoid personal attacks and rather silly comments. invisible expo – with all respect, i do not think you are helping your cause. FYI Invisible.Expo and Expo.Goodcop are posting from the same IP Address. So, again you attack Bob for being behind anonymous posts, yet you do the same. Honestly, this is completely out of hand, the banter between the two of you has nothing to do with SAs. If anyone wanted to read comments from other student ambassadors they’d have to wade through such extraneous arguments. How disappointing to hear about our pathetic USA Pavilion. I went to a kickoff party here in Texas at the Chinese Consulate, attended by the governor and Yao Ming. There was a lot of excitement for the Expo. Shame! Glad to see this post is still being read into the New Year 🙂 While browsing I found this piece referenced on wikipedia as well. I’m currently writing material for http://www.iseastars.org and look forward to writing more @ CL when I return this spring. May we hope that the USA shows more soul at the 2012 S. Korean EXPO. How strange, at least half or more of the comments published by student ambassadors have disappeared. Hence, we have only the bizarre exchange between “invisible expo” and “expo goodcop” on one side, and me on the other. This conversation, however, was much richer and personal on the part of the SAs. Pity. BTW, someone has suggested to me based on her inside information that the comments made here and elsewhere that the two anonymous handles used to attack me are in fact not only from the same account, as Elias reports, but from the same account at the Singapore office of a global PR firm with close connections to the SE 2010 organization. If so, I hope the firm assists this quite sick individual to get help soon. But sad to report that the guy who tactically executed the “USA Pavilion” scam is now retiring to a peaceful existence, government pension in hand. Justice in America takes a holiday. But not for long. @ Bob I believe you can see the rest of the SA posts if you click the small yellow link “older comments” above the word Trackbacks/Pingbacks. Yes no doubt the attacks came from a single IP address playing good cop/bad cop, pretty amateur if you ask me. I wish you well with your pursuits and look forward to hearing what comes of your continued investigation. It is truly shameful as to how the US is viewed in the global eyes, my international friends tease me for coming from the host country of the obdurate “tea party” and a land where the Bible is quoted in environmental policy decision-making. May we hope for a brighter future. Am I the only one who is waiting anxiously to hear more about the mysterious budget spending? This sounds like something of a scandal of its own. Wow. I remember having glanced at this article post-Expo and never realized the discussion that arose in the comments. Although it’s now been well over two years since the conclusion of Expo, I’d still like to mention a few things that were brought up in the article and in the comments. First of all, I was a “student ambassador” from the 2nd session. I say that title with hesitance because although I initially arrived as a part of the program, my schedule and role was changed to accommodate my role as a student. I had assumed that we would have regular shifts for the program (as opposed to rotating shifts) and scheduled to start my junior semester abroad in Shanghai (at the East China Normal University). Because of this, I was placed in an office role within the finance department. This of course came with the aforementioned benefits of air conditioning and sitting in a chair for the majority of the day, however I did work regular eight hour shifts and often took the work home and came in over the weekends. In regards to the finances, I remember it was a complete nightmare to work with. The finance department consisted of four SA’s (one of which was an SA first session and became staff for my session) along with our two managers who were actually in-kind contributions from Deloitte. I did not work with monetary sponsorship but organized all of the value-in-kind donations from corporations. One of the biggest issues we had was that the corporation itself would OVERESTIMATE the amount of their contribution. For instance– items such as the “show installation and construction” included both the hardware installation as well as the content and many of these contracts were signed well before actual contributions were made– basically ESTIMATES that were confirmed as reality on paper before actual materials could be received. Additionally, there were a combination of items that were contributed and unused and left in stock as surplus that the corporation gave in order to attain the sponsorship level, contribution that were continuous and had to be consistently reimbursed and tracked through multiple sources (ie. Walmart receipts), and items that had been MISTAKEN as contribution, used, discarded, whereas actual contributions were lost. The entire scene was a complete mess, the biggest issue being reimbursements for supplies and events. What I can tell you is that many of these numbers are hardly concrete, estimates from before, during, and even after the dust had settled. The Deloitte managers I worked with had incredible character and often worked well after midnight to try and sort out the mess that was created as a combination of faults on both the pre-planning and corporations’ sides. We handled all reimbursements with care and scrutiny, and there were several cases where reimbursement had to be refused, so if there were issues of “corruption” or “wrongdoing,” I suspect it occurred long before the program began, or above the knowledge of the finance department and documentation submitted to the IRS. I enjoyed my time at the USAP. In fact, it’s probably one of the best memories of my life thus far. At one point I had to commute between the expo grounds and my campus on crutches and I do regret not having made more friends with the time I had, but I appreciate the changes that were made the first session because I only have good recollections of the program. Thanks! Hi Jane, I enjoyed reading your comment, which came as an email last night. I’m glad the united efforts of the 1st round SAs made for a more enjoyable experience for the 2nd session folks. Sounds like you had a good time, but damn I can’t imagine navigate the Expo in crutches. One of my roommates was pretty high up in Finance, and spoke to me on behalf of so many loose-ends and hiccups in terms of numbers. He was wanted to share some more concrete data on the financial discrepancies but didn’t want to jeopardize his MBA. I too shared in the spoils of the “Wal-Mart” credit, Caleb (one of the petition pioneers) and I were reimbursed for DJing and planning the 4th of July party in Walmart bux, which as you may have expected, was cashed out in tequila, 6 month supply of mach 3 razors (they are pricey) and brie cheese. By in large so much money was squandered and I wish there was an IRS investigation, but alas it’s history and I hope that the US takes a different path in the future. The worst part is that the complaints and conditions posed in this article are oddly very familiar. It is happening all over again at the Expo Milano 2015 in Milan and some SA’s have been brainwashed and convinced that it’s all okay. This article is great and I’m really happy you guys were strong enough to make a formal and collective defense for yourselves. I wouldn’t be surprised if another article comes out like this for Expo Milano 2015. It’s really sad that this is how our country presents itself and treats people, whether it be public funding or private funding, it is still a reflection of the USA and against all moral standings. The process is as corrupt as the people behind it. Rotten diplomacy, funded unwittingly by the American people.